While the pool is open at some point each day there are times when swimming is not available due to swimming lessons so please check the timetable to see when you can swim*. There are early bird sessions, lunchtime swims, adults only and family fun swims, so there is something for everyone in the weekly timetable. The timetable also changes in local state school holidays so you can swim more at certain times of the year. Swimming for anybody, including children and adults, depending on numbers a lane may be provided for faster swimmers, but this is not always possible. 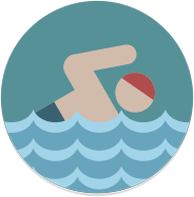 No children, generally swimmers will swim in lengths, allowing everyone to swim up and down. Only for children or families, no lone adults will be permitted, toys and floats are in the water for what can be a busy boisterous session. Use our spa facilities along with your swim, for just £6.